Yahoo, a company with a brand new CEO, Ross Levinsohn, is shutting down it’s News stand that it started just months ago. In an application I nor many of you have ever heard about Livestand, was supposed to be Yahoos response to Flipboard which like many of Yahoo’s recent projects has failed. In an attempt to turn the company around Levinsohn is trying to streamline what the company does. While we received great feedback on Livestand’s design and it earned a 4-star rating in the App Store, we committed ourselves to continuously measure and scrutinize what’s working and what isn’t. We have learned a lot from Livestand and are actively applying those insights toward the development of future products that are better aligned with Yahoo!’s holistic mobile strategy. Regan Clark mentions on Yahoo’s Blog. While never making any inroads or showing any interest in Android, Yahoo is said to be wanting to push full steam ahead with Mobile, as seen with it’s recent launch of Axis. As announced during our most recent earnings call, we’ve decided to discontinue or consolidate a number of products across Yahoo!’s technology platforms over the course of 2012. Platform consolidation enables us to put many Yahoo! properties onto common key platforms and technologies to make everything more scalable and nimble. And when we discontinue products, it will be so that we can focus on opportunities where we lead and where we can create the most meaningful experiences for people using our products, and for our partners, developers and advertisers. 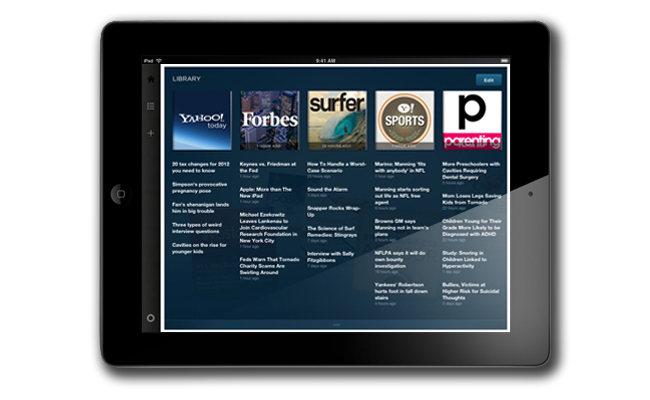 One of the first decisions we’ve made along these lines is to discontinue our personalized digital newsstand app, Livestand for iPad. We are pivoting to a mobile-products-first development model (check out Yahoo! Axis as a great example of this) and there’s no doubt that one of the biggest, if not THE biggest, priorities for us is to innovate for the mobile user, whether they’re using feature phones, smartphones or tablets – or iOS apps, Android apps or mobile web browsers, for that matter. We know we’re headed towards a time when people in all markets will actually use the web more on connected devices like phones, tablets, TVs, and consoles than they do on PCs. We already have millions of people using Yahoo! on mobile phones and tablets each month, and are seeing that number grow rapidly. With all the great things we learned from people’s interactions with Livestand, we know we can create beautiful, easy-to-use HTML5 media properties that give the richest experiences to the most people. Stay tuned as we continue to reimagine the products Yahoo! delivers across all the devices you choose to use. With that said, Mobile being a key component to Yahoo now, why would you kill something that wasn’t on the receiving end to confusion like Axis is. Yahoo like AOL is going through some confusing times with it not knowing what it should be. However, before things get any worse for Yahoo, figuring out what it wants to do might be a smart move. If you are focusing on Mobile why start to kill of things that fit that area.